Posted By:Unknown | At:8:37 AM Be the first to comment! 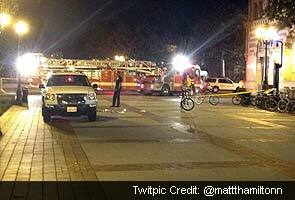 LOS ANGELES (AP) — Authorities say four people have been shot and wounded during a Halloween party on the University of Southern California campus. Capt. David Carlisle of the USC Department of Public Safety says two people were detained following the shooting shortly before midnight Wednesday. Los Angeles police say the four victims were rushed to hospitals after the shooting at Tutor Campus Center. There was no immediate word on their conditions. According to KNBC, Assistant Chief John Thomas of the USC Department of Public Safety says a dispute between 2 non-students led to the shooting. The Los Angeles Times reports that the violence occurred outside the party attended by about 100 people. Police then declared the campus "shut down" and issued an alert urging students to remain indoors. Campus police did not provide any details on the two people who were detained.